ArtyFartyAnnie: Remember - Happy 5th Birthday CSI!! 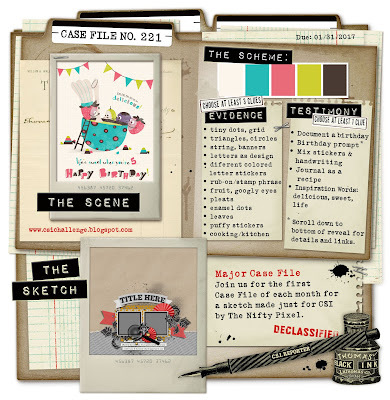 CSI (Color Stories Inspiration), one of my favourite scrapping challenge sites, has its 5th birthday this month. Debbi Tehrani, creator of CSI, has invited Retired CSI Detectives to help celebrate by making a page or two for January and I was thrilled to be asked - especially as I have promised myself I will get back to some scrapping this year, so it's perfect timing!! So, what clues did I use?? Scheme: predominantly watermelon pink, with pale yellow/ivory, dk choc brown and touches of apple green and turquoise. The neutrals are allowed as extra. Evidence: tiny dots, string, stamped word, enamel dot, leaves. "Take a bowl full of beans, add sweetness, sprinkle with hundreds and thousands of questions, throw in a stubborn streak, temper with affection and season to taste with laughter and fun, add a dash of devillment and garnish with plain weirdness. Marinate in a mixture of joy and adversity and leave to develop for several years and you will have a young woman to be proud of." Well, this has really got my scrapping mojo going again - I'm going to start on the next one now!! Ah so nice to see you back again Annie. I have to say this is one place that I have really missed and I even found time to play. Such a lovely layout I love the ombre background and the recipe is a great way to journal. Lovely stuff. This is beautiful, Annie! Love the mix of patterns on ehre and the dramatic black touches. Thank you so much for guesting! Love your choice of different papers !!! A beautiful layout, super features including the tag in the envelope and the pretty flower clusters. Lovely to see you back. A great page! Lovely details. Thanks your playing with CSI! Awesome page Annie! Love the scallops peeking out of the top layer!